You’ve heard the old wives tales about eating spicy foods to induce labor, right? Well, this one takes it to a whole new level — a level I, for one, am totally down with. Cookies. Can’t wait any longer…try these! But beware…they’re pretty spicy. Once cooled eat as many as you can possibly stomach, lie down for a nap and wait for labor to begin. I had to try them. I’m not exactly trying to jumpstart labor, but I consider this important research for those of you that are. 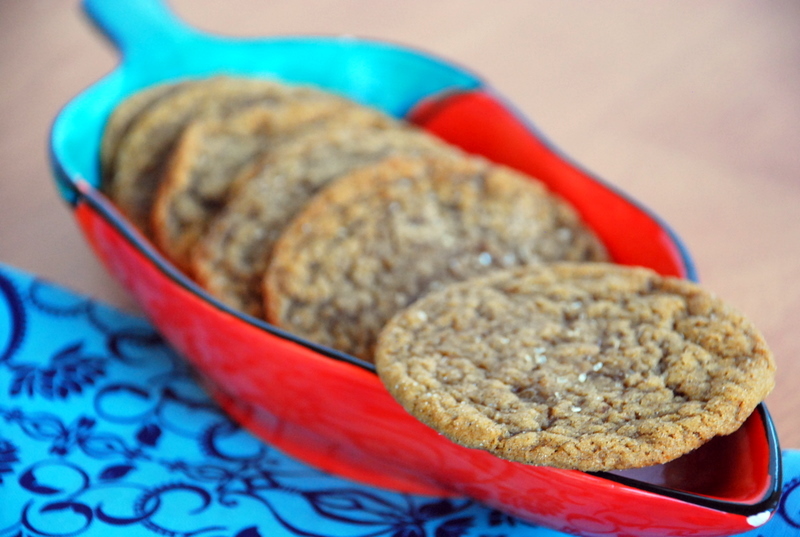 They are chock full of yummy spices (cinnamon, ginger and cloves) and one who’s-your-daddy-spice (cayenne) but the result is a really yummy aromatic cookie with a kick at the end. The net result? If someone told me to eat five of these…I would not complain. Preheat oven to 350 degrees. Combine flour, baking soda and spices and set aside. Cream the butter and sugars together. Add the molasses to the creamed butter, then add the egg whites until combined. Add the dry ingredients slowly. Chill 1 hour (up to overnight). Drop spoonfuls of chilled dough onto baking sheet. Bake 8-10 minutes. Sprinkle with coarse sugar if desired.